On our never ending quest to bring you looks at as many of the top Samsung Galaxy S3 cases as we can, the next stop is back with our friends Spigen SGP, and their Modello and Ultra Thin Air cases. Both cases are affordable, come in a variety of colors, and will give you some protection without feeling like your phone is hidden behind a brick. The Modello case from Spigen is their take on a TPU case. It’s essentially a rubber case that fits tightly around the entire device, even up onto the front a tad, to give it face down protection. 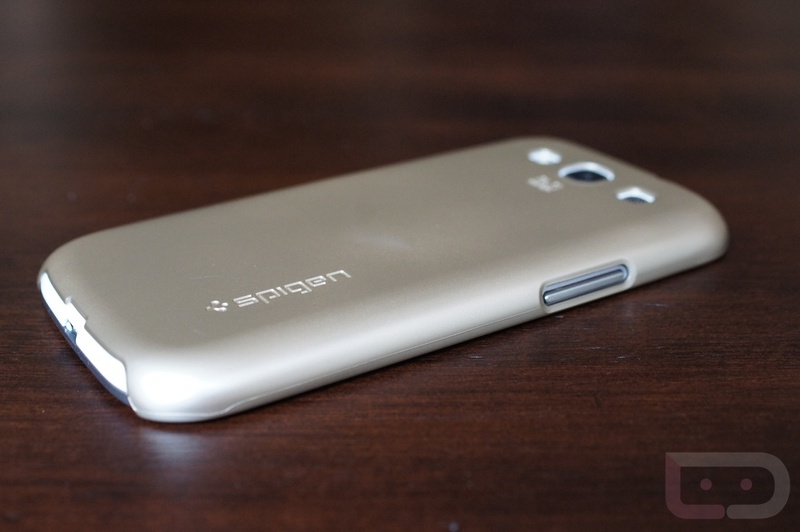 Spigen’s, to me, has a much more textured feel than other TPU cases in the industry, something I liked while holding it. It didn’t just feel like a glossy rubber case – it felt like they spent time making it feel and fit perfectly. There are cutouts for the camera, flash, speaker, volume rocker, lock switch, headphone jack, microUSB port, and microphones. Again, it fits perfectly, but one thing I really love is the fact that it barely touches on the front of the display. 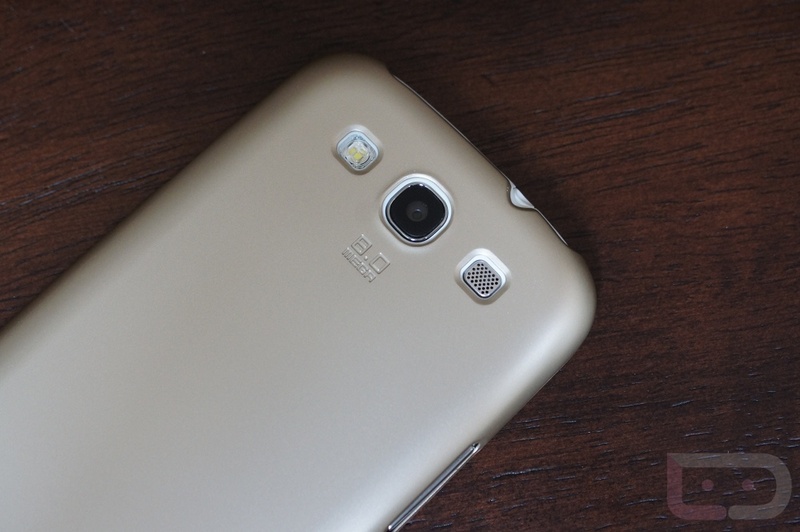 Too many TPU cases cover up the front side of the device, something I can’t stand. 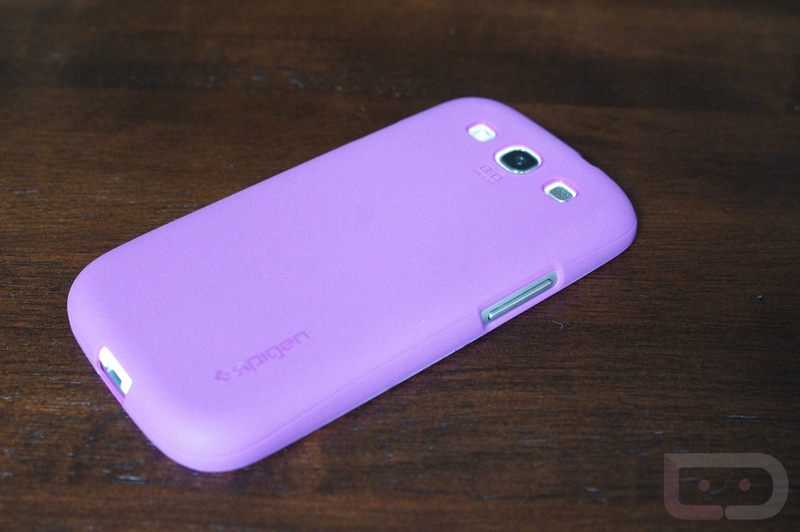 Spigen’s does a great job at giving you just enough protection without taking over. 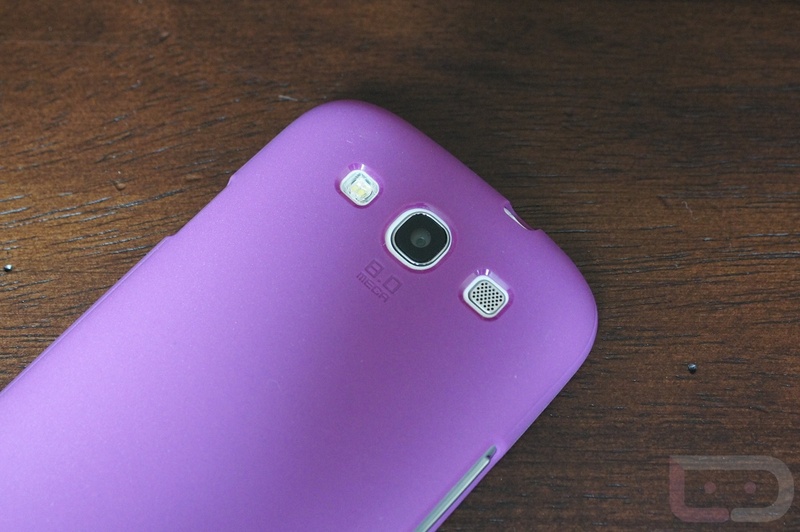 At $15, you can’t really go wrong with this case, especially if TPU is how you roll. The case comes in 7 different colors: black, brown, red, blue, purple, green, and grey. The Ultra Thin Air is Spigen’s attempt at creating the ultimate minimal case that offers a bit of protection, but still highlights the design of the device. 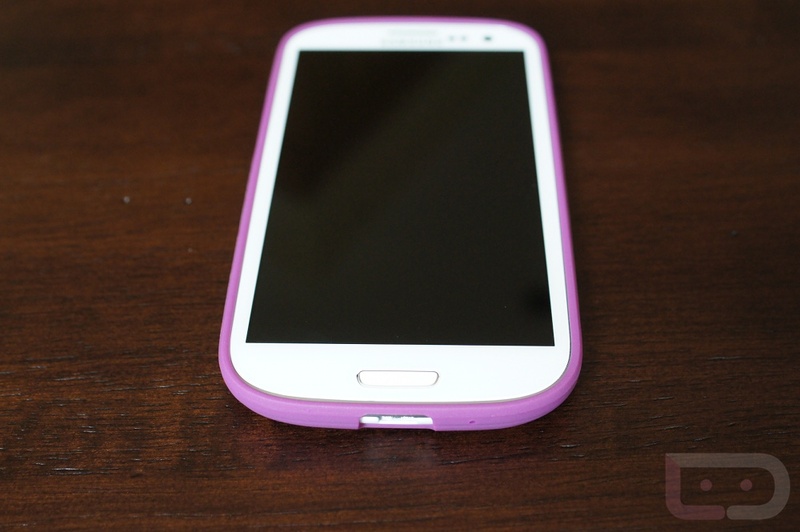 It’s made of a polycarbonate material that was custom formed to fit as perfectly as possible to the Galaxy S3. Now, in the past with Ultra Thin Air cases, I was obsessed. 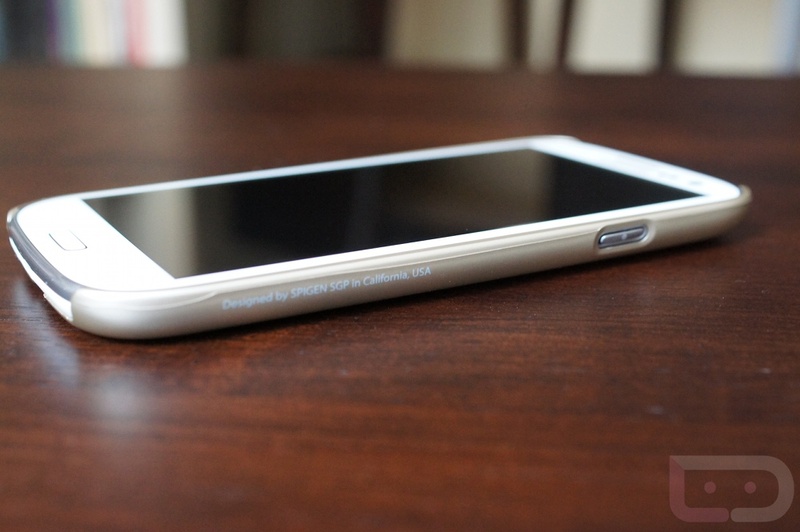 In fact, the Ultra Thin Air for the One X is probably in my top 3 cases of all time. 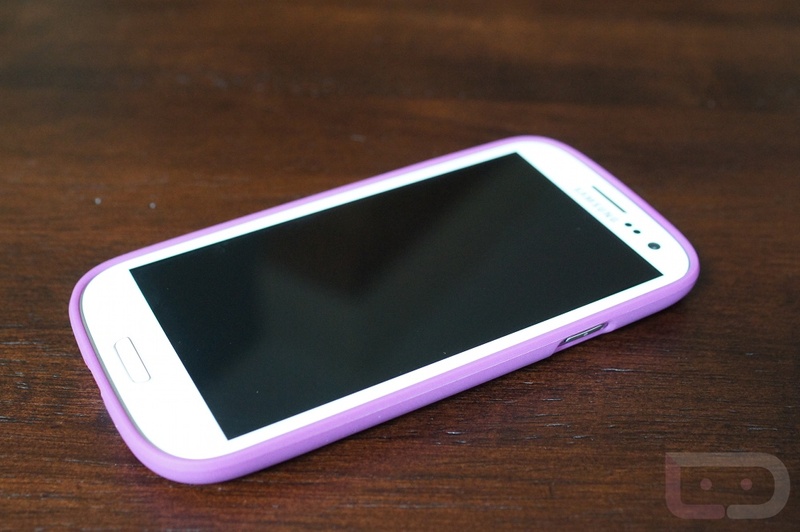 The Galaxy S3 version on the other hand, not so much. This case was too slippery for my liking. I also managed to damage the cutout for the lock switch within one day of use. I don’t necessarily think that is going to be normal, but I had to mention it. I’ve also noticed that on the silver and gold backs, that there is this slightly washed out spot in the middle. You can actually see it in the picture of the back below. 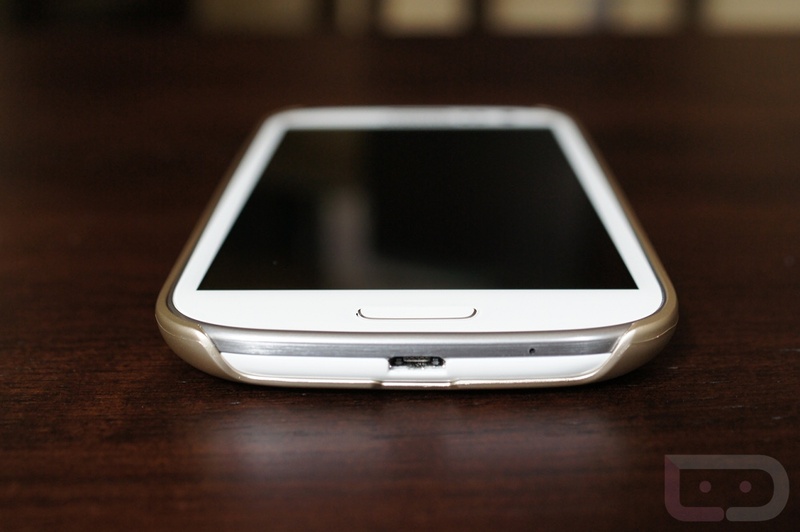 So while I love the idea of the Ultra Thin Air, I’m not sure that the Galaxy S3 version is up to previous standards. It will run you $19.99, but that also includes a screen protector. I’d suggest going with maybe the black or white, as the black for the One X was not slippery and was a dream. You may want to avoid the gold and silver though, as they are the two I handled and based this review off. It comes in 8 different colors: black, silver, red, gold, mint green, white, pink and orange. 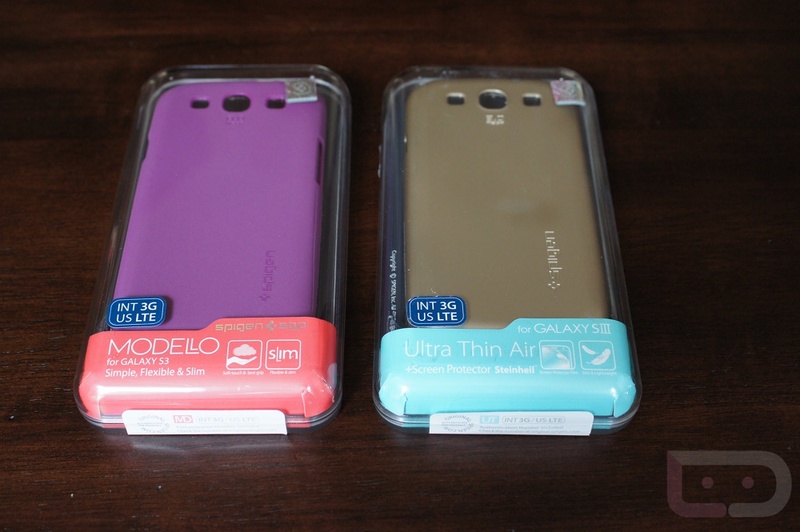 We have 6 cases total to give away – 3 Ultra Thin Airs and 3 Modellos. Update: We have picked our six winners and emails have been sent out. Go check your inbox! 1. In the comments, tell us how many Android devices you have owned and what they are. 2. Also, tell us which case you would like to win and in what color. Modello: purple, black, or grey. Ultra Thin Air: gold, white or pink. 3. Feel free to share the contest page with your social network of choice. 4. Tomorrow at 10AM, we will choose winners randomly from the comments.